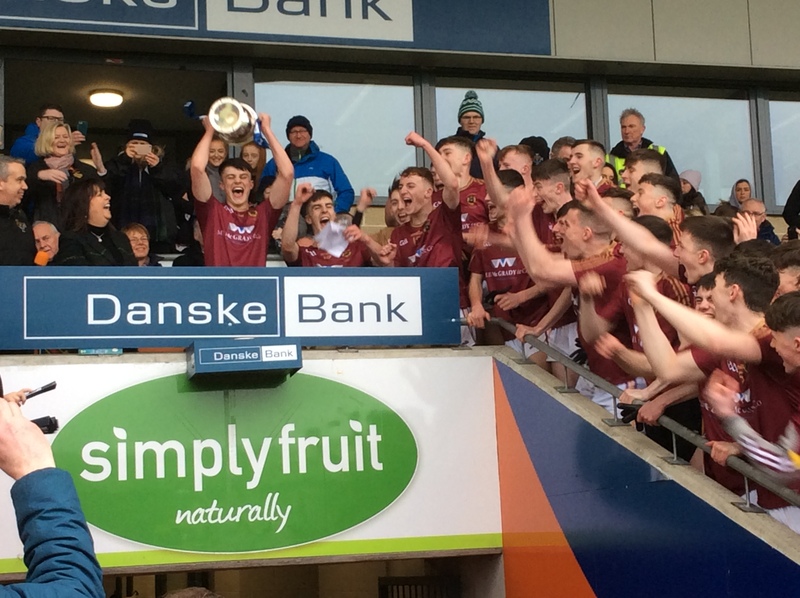 DESPITE having to play the last 10 minutes without impressive free-taker Ruairí O’Hare St Patrick’s Downpatrick captured the Danske Bank MacLarnon Cup with an impressive finish to an exciting end-to-end final at the Athletic Grounds in Armagh yesterday. O’Hare, usually a midfielder but carrying an injury from a recent soccer International, went to full-forward from the start and was a thorn in the side of the Derry city combination team throughout the opening half, totting up five points. After the break his impact lessened, but he was still the focus for the Downpatrick attack. When he picked up his red card in the 52nd minute he had just pointed to open up a two points’ lead for his side. However Ronan Connor fielded a superb long ball out of defence to fire over an inspirational point from wide on the left and in the 57th minute Eoin Rooney intercepted and burst through the centre at full pace to release Conor Murray. Murray drew the defender but looked to have overcooked the pass to Tim Prenter. However the RGU clubman managed to get his right foot to it and drag the ball across the goal area and inside the far post. It was Prenter’s second goal and clinched the Player of the Match award, but the corner-forward believed that defender Jack Harbinson was more worthy of the award. Team manager Declan Morgan felt that the whole team stepped up to the occasion. “At half time we thought we had played very well in patches but switched off at times as well. Our focus at the break was improving on the areas where we were weak and the boys did that. “We were guaranteed a place in the All-Ireland semi-final no matter what happened today. It would have been devastating to lose here today and then try to build them up again for another match. We don’t have to worry about that now. Brandon Boyd set down an early marker for the East Down school taking possession from the throw-in and soloing forward for the opening point after 20 seconds. The other wing-half back Peter McMullan grabbed the kick-out and soloed through for Ronan Connor to hit a second score. Within four minutes however Cathair Dhoire had moved two ahead with Cahir McMonagle, Fergal Mortimer (free) and Ben McCarron (twice) hitting the target. Indeed McCarron could have bulged the net on two occasions with the Downpatrick all at sea. But as the half wore on, the Down side regained their composure all over the pitch, helped no doubt by a 7th minute goal from Prenter; nothing more than a point looked on, but he dummied, jinxed inside and then blasted to the near side post. A score a minute at this point, but that pace couldn’t last. It didn’t, mainly because both defences settled, although the big players on each side – O’Hare for Downpatrick and Mortimer and McCarron for Cathair Dhoire continued to created the openings. O’Hare scored the next five points for his side, two from frees he won himself, and McCarron hit back with two at the other end and Downpatrick held a 1-7 to 0-6 lead after 24 minutes. Then Oran McGrath grabbed a kickout around 60 metres out and burst through the centre. He seemed to have lost control of the ball but swung his boot at it and it went across Eoin Maginn into the right corner of the net. Although Mortimer levelled soon after, Brandon Boyd’s long free gave Downpatrick a 1-8 to 1-7 interval advantage. On the re-start Prenter and a punch from Connor edged the Down side further ahead, but Cathair Dhoire took the initiative for the next 15 minutes to draw level at 1-10 each – and again there were goal chances going abegging, Maginn denying McMonagle and McGrath within a two minute spell. During the last 20 minutes however the Red High, with a very vocal support cheering every score, turned the screw and deservedly took possession of the MacLarnon Cup for the first time in 18 seasons. Subs : T Carson for L Guinness (41), R Quinn (0-1) for T Savage (43), C Murray for T Smyth (48), D Donaldson for R Connor (59), R Wynn for O Cunningham (62). Cathair Dhoire: M Stephenson, P O’Flaherty, N Ó Mianáin, M Lynch, J Mullan, S McElhinney, C McLoughlin, C Mooney, O McGrath (1-0), S Browne, B McCarron (0-6, 0-2 frees), F Mortimer (0-3, 0-2 frees), R Brown, E Cassidy (0-1), C McMonagle (0-1). Subs: J Lynch for R Brown (26), J óg Moore for S Brown (50), T O’Kane for C McLaughlin (58), O McMenamin for J Mullan (58).